Beautiful You: Mini Series | What's In My Wardrobe! Mini Series | What's In My Wardrobe! Hello Lovelies! Welcome back to Beautiful You! Today is the last instalment of our mini series, I cannot believe this is the last post already I can remember when us girls started this! 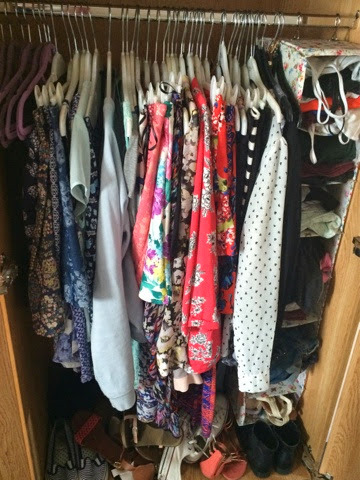 Anyone today's post is 'what's in my wardrobe' and I didn't really know how to do this so I've just taken a picture of my wardrobe and I'm going to talk about some of my favourite things in there! My wardrobe is very tiny as I am currently living in halls as I'm in my first year of uni but I think that I have made the most of space so I will talk you through it! First of I bought this hanging shoe holder from Cath Kidston which is down the right hand side of my wardrobe! In there is just keep vest, plan tshirts, long sleeve tops, cardigans, short/leggings and then the last compartment has some flip flops in there! Now for the best part my actual wardrobe, this is more organised than my one at home and I find it easier to find clothes. I try to organise the items by colour, that way when you want to find something that goes with a top for example it should all be in the same area! I have an monochrome section which has a few black and white shirts, some staples like a black maxi, a body con and skater skirts. The best section is my favourite as it is all my orange clothes, I just have a few tops, a couple of skirts, a skort and then my ever so famous Primark jacket! The next section is kinda jumbled as it was supposed to be pink but some multicoloured clothes ended up in there! I again have a few tops, a dress, my kimono, a dipped hem skirt and a couple of skirts that I am loving at the moment! Next up is probably my most worn section as I am a sucker for navy, it's the blue section! I have a lot of tops in this section, another kimono, a crew jumper, a lot of skirts and a lovely turquoise lace dress! Lastly, I just have all of my jeans bunched together so I always know where to find them! The range from plain blue jeans, acid wash, I have a lighter blue pair and I also have a pair of black ones! Lastly at the bottom of my wardrobe I have my shoes. I know I know I have a lot but in the summer I have an obsession with flip flops and I can't help it. Plus a women can never have to many shoes, I wear them all I swear! And that is it, my wardrobe isn't the nicest at the moment but I am hoping that next year I could potentially get a stand alone rail to store my clothes on as my room is bigger! I hope you enjoyed this post none the less and I will be back on Monday with a beauty post! Have a lovely weekend everyone! I love this post! I'm in desperate need of sorting my wardrobe out haha!